The government-sponsored entities (GSEs) have debuted six new capital markets risk-sharing transactions since fall 2013. The deals have been designed to transfer credit risk away from taxpayers while preserving for investors the benefits of the GSE guarantee, and they will play an increasingly important role in the FHFA’s plans for the GSEs, as FHFA Director Mel Watt said at his first public speech, on May 13. So far, the GSEs have limited the transactions to extremely low-risk loans, but later this year, Fannie Mae and Freddie Mac will debut deals comprised of riskier mortgages. Investors already have shown interest in GSE risk-sharing, but the forthcoming transactions will gauge investor appetite for less-than-pristine GSE loans. They will also allow the GSEs to assess how their guarantee fees and loan-level pricing adjustments (LLPAs) compare to what the market would charge. How do the deals compare to the GSEs’ entire book of business? The reference pools in each of the six transactions are larger and more diverse than in typical private-label securitizations, and are comprised of high quality, recently originated mortgages. Fannie’s two transactions comprise just 2 percent of its total single-family book of business, and Freddie’s four deals comprise 7.2 percent. 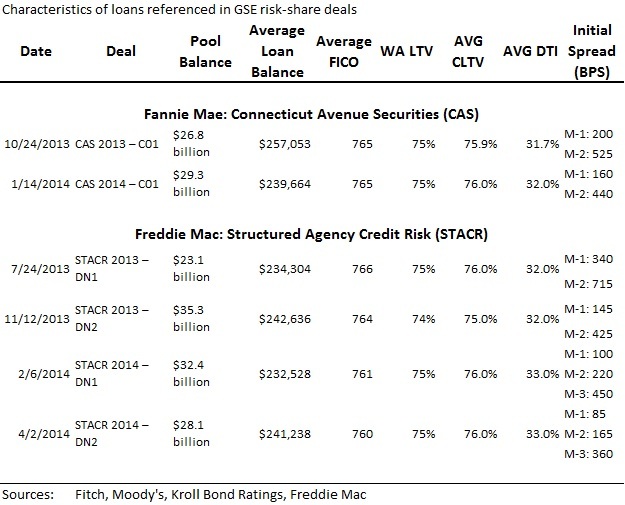 To date, the transactions have laid off risk on loans that were fairly safe to begin with: The CAS deals had average credit scores (FICO scores) of 765, 24 points higher than the average FICO on Fannie’s entire Q1 2014 portfolio. The STACR deals had average FICOs of 766 to 761, 22 to 27 points higher than Freddie’s Q1 2014 average of 739. 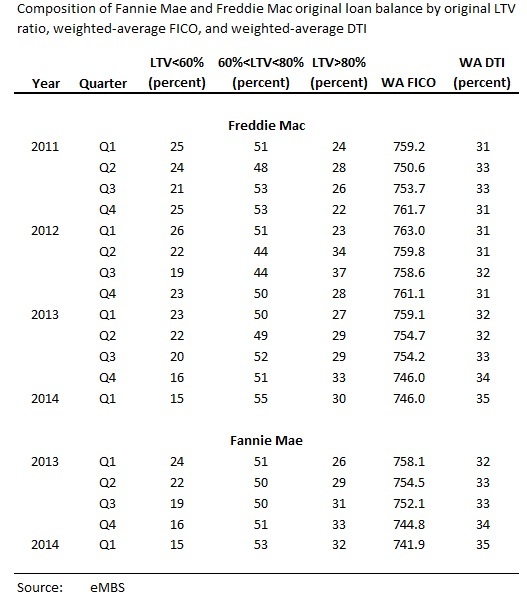 Similarly, while STACR and CAS only include loans with LTVs between 60 percent and 80 percent, over the past three years approximately 30 percent of all loans in Freddie Mac’s portfolio had original LTVs above 80 (see Table 2). Even excluding the high-LTV HARP loans, fully 20 percent of loans held by both Fannie and Freddie have LTVs above 80 percent. The GSEs hold a much broader mix of loans than the deals so far, and ultimately the risk-sharing deals must expand to reflect this wider universe. Diversifying the loans in GSE risk-share deals could also serve as price discovery, showing the GSEs how they are pricing guarantee fees and LLPAs relative to the market. If the higher-risk loans don’t sell or sell only at high prices, then this is a signal the market would charge more for these products. It does not mean the GSEs must change their pricing; cross-subsidization is a legitimate policy decision. But significant disparity between GSE pricing and the market price will make that decision explicit. And, at the minimum, market results will provide additional input into the LLPA pricing discussion. Even as policymakers contemplate GSE reform, Fannie and Freddie are experimenting with new ways to share credit risk with private investors, and experimenting with reinsurance in addition to the six capital markets transactions. Success of each of these risk-sharing transactions is a sign that private capital is available to take mortgage credit risk, providing a model for any future housing finance system reform. The true test of investor demand for GSE risk-sharing will come when Fannie and Freddie begin rolling out deals with higher LTV loans and other criteria reflecting their broader book of business. While the first high LTV deal will likely price wide, we expect that pricing will become more favorable with each transaction, as investors become more comfortable with the product. The STACR and CAS deals are important steps in drawing private investors back into the mortgage market, but the enterprises will need to diversify to meaningfully transfer single-family mortgage credit risk to private investors.